Available in 7×9, 8×10, 9×12 & 10×13. 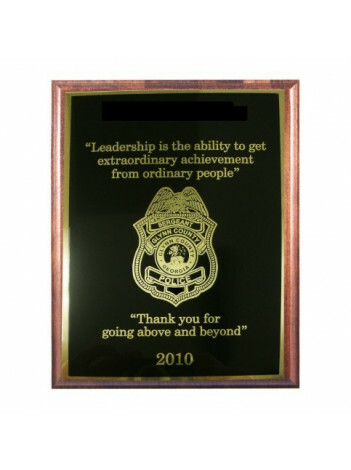 The text and up to two agency logos are included in the price (Most Federal Law Enforcement logos are available). Simply add this item to your shopping cart and our Engraving Technician will contact you by email for engraving instructions. A proof will be generated and emailed for customer approval. Typical production is 2-3 days. Pricing starts at $40.00 and will adjust according to plaque size. Standard plate configuration is a black plate with gold lettering and a matching gold border plate.